The family’s statement, reported by the Los Angeles Times, was contrasted by another perception of the Santa Fe school shooter. According to Sadie Rodriguez, mother of 16-year-old Shana Fisher, who was killed during the shooting, her daughter had “4 months of problems from this boy.” “He kept making advances on her and she repeatedly told him no,” Rodriguez added. Though the Los Angeles Times was unable to corroborate Rodriguez’s claims with her daughter’s friends, she has insisted to multiple outlets—including the Associated Press, CNN, and a handful of local outlets—that Pagourtzis persistently harassed Fisher. “He continued to get more aggressive,” she added. Rodriguez claims that her daughter, who recently turned 16, was the first of Pagourzis’s victims, implying that her murder was an act of retaliation. While the question of motivation remains unsettled and may, as is so often the case, remain this way, the description of events from Rodriguez resonate, in large part, because they were grimly familiar; another of a seemingly endless number of stories about mass shooters and gendered violence. It is yet another story of frustrating contrasts between “sweet” boys and dead girls; particularly the telling contrast between a “sweet, quiet” boy and a boy who may have harassed a girl for months and later shot and killed her along with nine other classmates. It’s even more revealing that these two conflicting perceptions can and do exist simultaneously. 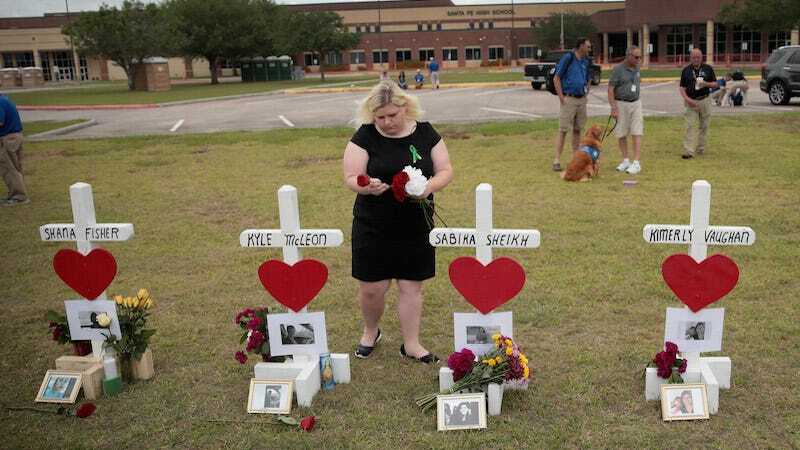 Very rarely does the harassment of girls or women impugn the claim that a man or boy is good or kind or inherently valuable; rarely is such harassment considered solid evidence in the post-mass shooting deconstruction of “missed warning signs.” Even Texas Governor Greg Abbott insisted that there were “not those types of warning signs. “Here the red-flag warnings were either nonexistent or imperceptible [...],” Abbott added. “Missed warning signs” is a phrase that, like “thoughts and prayers,” is a rhetorical fixture of the post-mass shooting narrative landscape. As a genre, the “missed warning signs” story acquires evidence of a mass shooter in the making, piecing together a disparate timeline compressed through the lens of retrospection. It often focuses on the shooter’s feelings—or, more vaguely, his mental state, deconstructing even the smallest “sign.” It seeks material evidence that clearly foreshadows violence to come. Overly concerned with “creepy” behavior, particularly behavior that marks the budding mass murderer as simply hiding in plain sight, it undervalues harassment and domestic abuse, which are too common to—too mundane—to mark a mass shooter as grotesquely unique. Instead, it looks for evidence that transforms a violent act into archetypal details. Pagourtzis, for example, owned a t-shirt that read “Born to Kill.” He also wore a trench coat, images of which he posted on Facebook. Both details have been reported by nearly every news outlet. If the “missed warning signs” story is eager to collect examples of a school shooter in the making, it is equally quick to demand a kind of empathy. Quick to point to rejection and bullying, it tacitly builds an image of a sad and lonely boy whose vulnerabilities were turned violent by mean, unfeeling girls (Kate Manne has called this “himpathy,” or the excess of concern for a male perpetrator). The result is a fictional construction superimposed in the aftermath. It drips with melancholy, molding a mass shooter into a kind of romanticized anti-hero. It stops short of lamenting a “once-promising” future but still asserts gendered value. Take, for example, a Washington Post story that describes Pagourtzis as “a quiet loner who regularly wore a trench coat to school, even on scorching hot days.” The Post report continues: “He had been bullied by classmates and coaches, one acquaintance said. And recently, he betrayed a growing darkness.” The tropes of the disturbed young man destined for violence are rehearsed here with near perfection: the “quiet loner” bullied by children and adults alike, slowly descending into darkness. That narrative was seized by Pagourtzis’s father who, in a recent interview with the Wall Street Journal, said his son was a “good boy” who was “mistreated at school.” He pointed to bullying as “what was behind” the shooting. Though the school district has said that reports of bullying are “untrue,” such empathy demands the construction and reconstruction of this myth. A lonely and bullied boy, the school shooter is transformed into a victim while the ten he murdered are further abstracted into archetypes. If bullying is often located as the cause of violence, redeeming this mass shooter from his crimes, then rejection is also often asserted as a rational reason for violence. In a much-criticized piece published over the weekend, a Reuters headline read: “Spurned advances provoked Texas school shooting.” The story is straightforward, but its headline linguistically posits a cause and effect, clearly positioning Shana Fisher’s “rejection” of her murderer as the source of his violence. It locates violence as an answer to rejection while geographically distancing itself from routine forms of violence, like harassment. For every dead girl, there is always a “sweet, quiet” boy. Or if not a sweet boy, then another boy or man who is driven to violence. There is a “lovesick teen” willing to kill a girl for breaking up with him or even refusing to go to the prom with him. There are men willing to kill ten people because he doesn’t have a girlfriend or murder 27 because he’s angry at an ex-wife. There are men so lonely that they believe their violence is justified, caused by women who won’t alleviate unnatural frustrations. There are men whose anger and frustration, they believe, will only be relieved when women are disciplined for existing without care for these unrighteous feelings. But these men and boys are rarely responsible for their behavior. Instead the dead—the dead girls—are transformed into both cause and effect. These boys and men are hardly responsible for the violence they render on others. The “missed warning signs” story is always quick to point at the slimmest thread of evidence, particularly when that evidence offers a certain exoneration, but rarely treats gendered harassment or intimidation as evidence in its case. The boy who persistently harasses a classmate can still be a “sweet” boy; classmates can still attest to his character, and family can still be baffled. His reputation remains rhetorically inviolate. Indeed, there is such eagerness to preserve reputations, to preserve a sense of order that posits his life more valuable than hers that we spin myths; spin tidy stories where everyone can enact their prescribed roles. The violence of boys and men is made unnatural, a monstrous creation of the women and girls who have rejected them or “spurned” their advances. In the details of “missed warning signs,” the reader is implicated (yet another form of redemption) too. The surreal accumulation of years of supposed evidence asks: How could anyone have missed this? There’s a certain irony implicit in the narrative that the story can never quite reveal; namely, that this evidence is ignored because the capacity for extreme violence is rarely believed. It seems like we rarely believe white boys or men when they tell us that they are violent. Harassment is explained away as “advances;” murder is transformed into the pensive sadness of a “lovesick teen;” a mass shooter is a “quiet, sweet” boy. A certain cultural order is maintained: The dead girl bears the responsibility for her own death so that the reputation of a “sweet, quiet” boy might live on. How many times do we have to write these stories?